In Elstree Studios GL2 stage today for this year’s first live Strictly. We’ve been involved in every series of Strictly – this year is series 15! Round One provide a data system which enables the judges to lock in their scores and signal them to the production team at the end of each dance, prior to them showing the scores on their paddles. 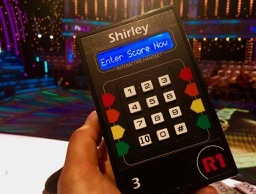 The system automatically records the scores and generates the totals, ready for use on the scoreboard. Our systems provide the production team with a comprehensive live data display in the production galleries, enabling them to analyse the judges’ scores and provide additional narrative to the presenters in real time.